Welcome to all who are new, I'll be writing on two people who affected Transylvania today, one who arguably didn't do much than be born there, and one who profoundly affected the way of life of people in Transylvania. 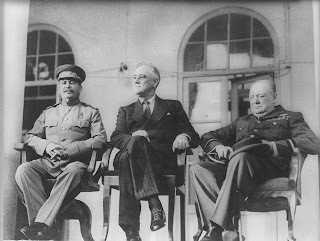 The man on the far left in this picture, Joesph Stalin, had a profound impact on Transylvania, which after the Second World War, became a part of Romania. 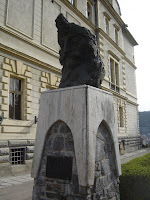 From there much of the unique history of Transylvania was lost, as the German and Hungarian population were reduced due to evacuations or emigration. Many Romanians, from the provinces of Moldavia and Wallachia, who never lived in Transylvania before immigrated there. This changed the dynamic of Transylvania, although none will argue that people do not love the land. This is Vlad Tepes, who was born in Transylvania. Do I need to say more? My Question for today is this: Who do you think affected Transylvania more?